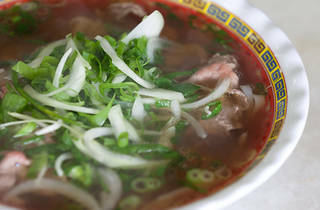 It’s worth pausing a minute when your bowl of pho arrives at Pho Tau Bay. 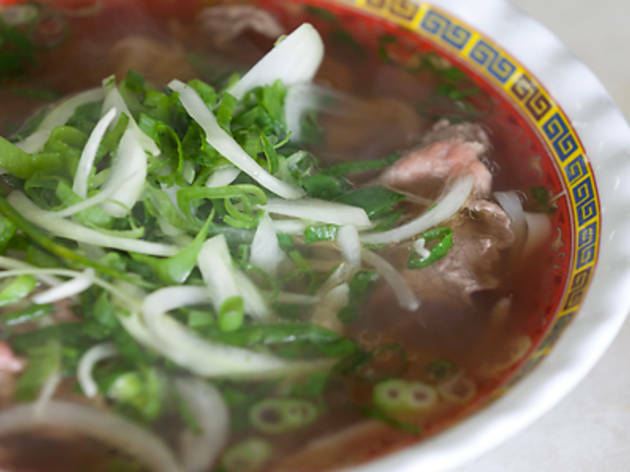 Hold your head over the deep bowl of beef soup chock-a-block with rice noodles, raw beef slices and curls of onion and breathe in deep. The stock is the clincher in any pho noodle soup, and the version here is a knockout – light on oil and punchy with flavour. The pho dac biet beef noodle soup with beef balls, tendon and tripe will set you back a mere $11 at this casual family-run restaurant. Upgrade to the large for $12.50 if you dare. It’s a gargantuan portion that arrives in a bowl that could double as a bathtub. Add your own bean sprouts, basil and lemon from the side plate. Communal bottles of hoisin and Sriracha chilli sauce are on every table. Chicken, fish and seafood noodle soup variations should keep everyone happy. Banh cuon rice rolls ($10) are a highlight: freshly steamed slippery rice noodle sheets wrapped around spoonfuls of pork mince and mushroom. It’s topped with thick slices of pork luncheon meat, deep-fried shallots and a refreshing salad of shredded cucumber, lettuce and mint. Douse the lot in nuoc cham sweet fish sauce dressing and you’ve got one helluva party in your mouth.